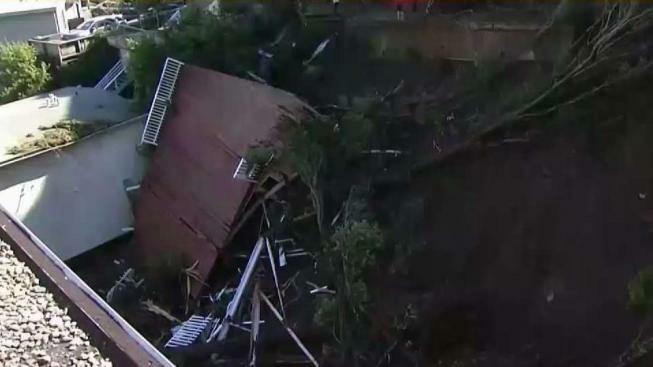 NBC Bay Area's Melissa Colorado reports on the aftermath of a mudslide in Sausalito. Families in Marin County are moving back into their evacuated houses after Thursday’s mudslide in Sausalito wiped out two homes and nearly killed a grandmother who was asleep in her bed. But for a handful of families, their homes are still at risk, and it could be days before they can go back inside. Seventy-five year old mudslide survivor Susan Gordon escaped with bruises but is miraculously still able to walk on her own. She currently has bandages over her face because of her injuries and did not want to be interviewed on camera. Her next-door neighbor Brian Wilson remembers waking up Thursday morning to the roar of a mudslide lifting up Gordon's home and taking it down with her down this hill. The mudslide also wiped out Wilson’s car and the entrance to his duplex. “I’m sitting on the windowsill, a fire truck came and yelled hey we’re here, we’re stuck we need to get out,” Wilson said. Wilson’s wife, their baby boy and their neighbors from the other apartment escaped through a back window. “We’re trying to find a new place to live and try to get our medications and get everything squared away but yeah we have nothing, everything is still in our house.” He said. Sausalito police say Wilson’s house is one of five homes that are red-tagged, and he says the mudslide has his family planning to head to solid ground. “No more hills, we’re not going to live in the hills!” he says. PG&E crews are working to restore power and gas to many of the homes on Sausalito Boulevard. City staff still can’t say when they will be able to remove all this debris.